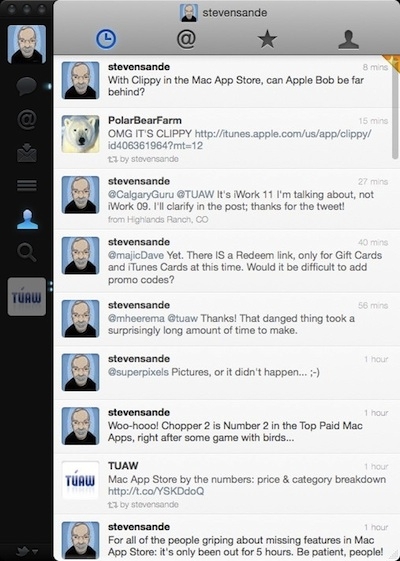 "The first Mac app I downloaded this morning after finishing the update to Mac OS X 10.6.6 was Twitter for Mac 2.0. This is the app formerly named Tweetie, and it's a free download from the Mac App Store." This is still number two on the list of free apps in the Mac App Store, so there are quite a few out there that must have been waiting for this app as well. It works similar to the iOS version except that when you click on a link inside a tweet, it opens in your default browser instead of within the app. I downloaded this as well, and it works. Guess that is bottom line for me since I'm not really a power user of Twitter. If you are, what apps or programs do you use?